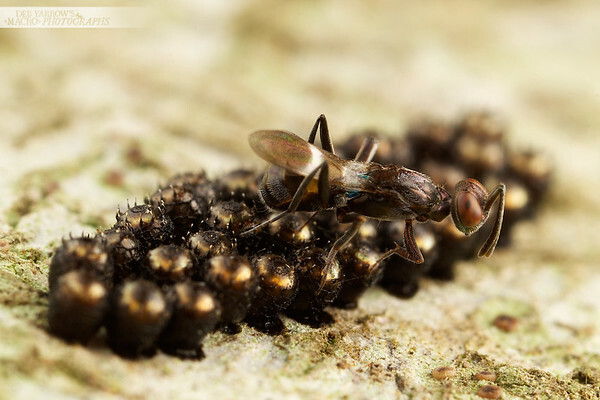 A featured collection of various parasitic wasps laying eggs. Quite often I come across the sad remains of a caterpillar over a row of cocoons. I assume they are the parasites that grew up inside the caterpillar now pupating into whatever their adult forms are. 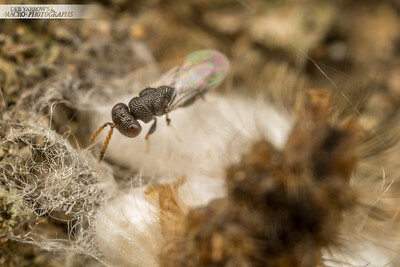 On this occaision I found a tiny wasp laying her eggs inside the cocoons which makes her a hyperparasite and maybe a fan of caterpillars. Oxley Creek, QLD. Wasp (right) is busy laying eggs in the flower head of a cobbler's peg (Bidens sp.) flower head when thrips shows up. Oxley Creek, QLD. 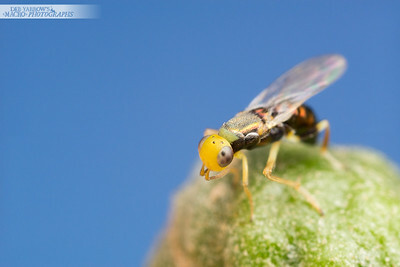 Neanastatus wasp lays eggs on an acacia gall. Oxley Creek, QLD. 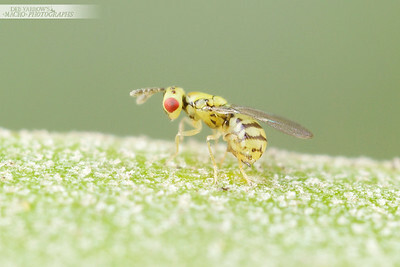 At a tiny 3mm long (max) I had no idea of how beautiful this little wasp was. 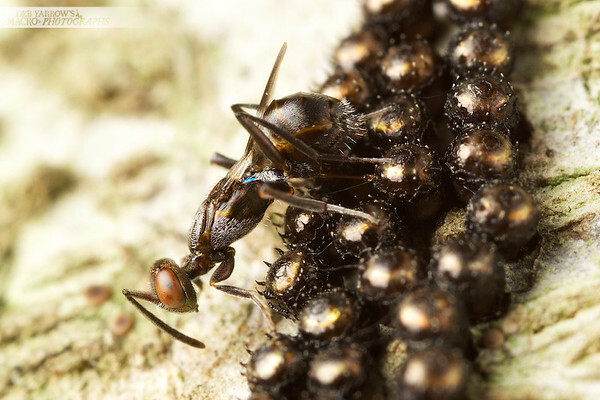 She's a metallic gold and was very busy populating these bug eggs with her offspring. You can just see her starting to pierce the bug egg with her ovipositor. She is actually looking for the eggs of another wasp that has already parasitised these eggs. Mount Ommaney, QLD. 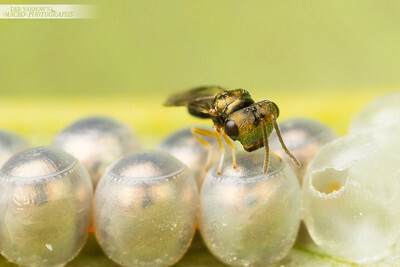 Tiny hyperparasitoid wasp (3mm long, max) investigates which of these bug eggs are most viable for her own egg deposit. She spent quite a lot of time wandering around 'feeling' with her antennae trying to work out where to lay her eggs. 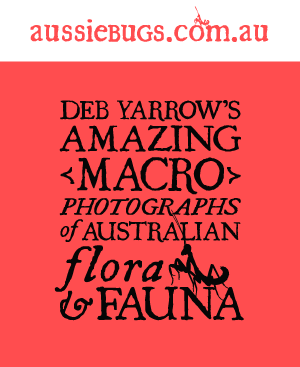 She is actually looking for the eggs of another wasp that has already parasitised these eggs. Mount Ommaney, QLD. 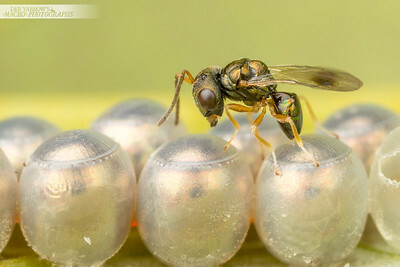 This beautiful chalcid wasp is taking her time inspecting these bug eggs for suitable candidates to lay her own eggs in. She is actually looking for the eggs of another wasp that has already parasitised these eggs. Mount Ommaney, QLD. 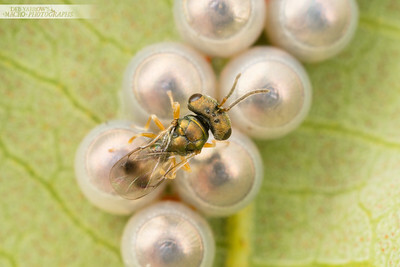 Tiny wasp, less than 1mm in length, appears to lay eggs in a gum leaf. Anstead, QLD. 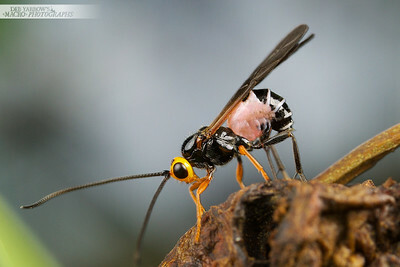 Parasite wasp (Callibracon sp.) puts an egg in a gall. Oxley Creek, QLD. 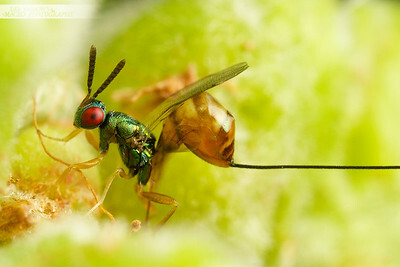 Tiny parasitic Torymidae wasp lays eggs on a gall. Oxley Creek, QLD. 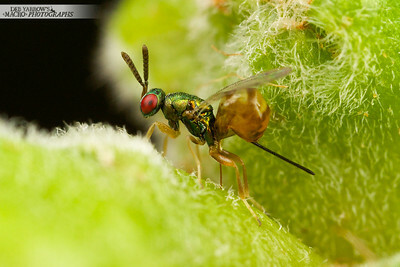 A tiny parasitic Braconid wasp injects her eggs into another insect's eggs. Oxley Creek, QLD.